Would anyone know how to make a good only leather scabbard easily and cheaply? I want to make some for my swords that didn't include scabbards when I bought them. Looking at one I have for the Black Prince the seam at the back is raised and adds some rigidity to the scabbard but it's still just leather so if one bends it too much and causes a crease in the leather it will be permanently weakened at the crease. 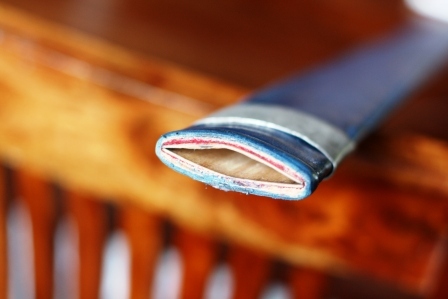 For safety and as a storage scabbard I think leather work well if one is careful to not bend it. Choice of leather is probably important to avoid the kind that is prone to cause corrosion due to the way it was tanned and residual acidity. ( I think veg tanned is O.K. chrome tanned to be avoided ). The leather should be thick. As to promoting rust I haven't had a problem with mine even with long period of storage. ( A little Renaissance wax or gun oil and occasional inspection and cleaning ). I suppose it depends on where you live. if you're in the U.S. you can order a double shoulder from Tandy on their website, I believe. or if not, there's a way to look up their store's locations. that should run you up about 75-80 USD, then add a bottle of dye, and you have probably another 15. then all you have to do is find a way to buy or make a chape and a throat, if you intend to use them. One easy and cheap way to make scabbards that are quite tough would be to use thin slats of plywood. This was amethod descríbed in some threads at the armourarchive and Peter Johnson once wrote of bend veneer layers used historically. I used three layered birch plywood .8mm thick, one layer per side. Cut it to shape roughly, did soak it in water over knight, put it on both sides of the blade, used narrow strips of cloth wound around the blade and glued the whole thing up and let dry. After that I glued on a second layer of cloth with the seam on the back. Sand the core between every step. Finally I added layer of 1-1.5mm leather. This construction ends in an easily shaped, formfitting light and quite resilient scabbard. You can make the cores for several swords in one evening. I used three layered birch plywood .8mm thick, one layer per side. Question: I have seen the example of wood forming on the old gaffer website...I wonder if this technique would accomodate hollow ground or blades featuring a strong central ridge...as this technique seems more suited for flat fuelered blades. Any thoughts? Well the brich plywood is made up of three layers. First I started tracing the sword outlines to a piece of ply, making two similar sized slats. I was soaking it over night and then formed it a bit. I made a scabbard for my Crecy, for the Yeoman and the I:33 this way. I tried it for one of Tods Rondell daggers you can easily shape the soaked wood around even strongly diamond shaped blades. After shaping the slats I took strips of cloth about 2cm wide in did wind them around the scabbard in spiral shape, in one direction only, I think you can do it up the other side two, might help against some twisting of the wooden core, but that doesn´t matter too much. Then let this dry or apply the first coat of glue on the wet core. The sword will stay inside while the scabbard is drying. After that add more layers of cloth/glue as you get a core rigid enough. The second layer of cloth had the same shape as the leather fir the final covering. Be sure to sand the core between every step so you get quite a smooth outline. Then just add the final layer of leather and you are finished. This was the way I read it at the armourachive. Look for the Chef de Chambre thread where they talk about later 14th cent sccabbards. Unfortunately they didn´t give exact reference. Here is apicture attached of my Crecy scabard. To reinforce what Felix said, here is a 19th century documentation of one by Violet le Duc. Several layers of cloth, soaked with glue, then sanded...this remind me a lot of fibreglass, and would make the use of it over wood not so heretical after all, and would allow for a much more resilient core. I'll pursue that lead! ps: thanks for the pics guys, and nice work felix! Lots of folks here have one or more Windlass leather scabbards sitting in boxes/closets. I don't even know how many I have--two complete "Erbach" and one "Saxon Hilt" without a chape, I guess, and I can't think of much use for them unless I can get an Erbach scabbard to fit my Town Guard (which would be an historically plausible scabbard for that sword). You should post a "Wanted" item with your specs in the Marketplace and see what turns up. I'd certainly be willing to sell some or all of mine. Can you please put up the reference for that image. And also the corresponding text regarding that image. Check out Eugène Emmanuel Viollet-le-Duc's ENCYCLOPÉDIE MÉDIÉVAL. Well, that was my impression too. It is similar in its resiliance. When I did my first core with two layers of cloth I tried its break resistance. I was really impressed. If you were building the scabbard up with the cloth and glue method that Felix suggested what type of glue would you use? Hide or would PVA be ok? Is there any particular type of fabric that you would recommend? What type of fabric did you use? In my case I did use the cloth I had lying around: cavas or linen. And I decided to use PVA glue, because it is so easy t work with. And the good thing about it: it gets sticky again after drying when you put on the wet leather. In all the process you will need to wax your sword thoroughly. Otherwise you willl get stains on it. After the scabbard is completely dry this doesn´t seem to be an issue anymore. Well PVA glue can be diluted or used undiluted but use a saturated with water wet wipe to remove any excess surface glue. ( You want the glue to saturate the cloth but not leave a thick film on the surface ). I have use PVA glue in the past to build up knife handles using tissue paper creating a " faux " bone or white micarta like finish. Using black acetate cloth and wrapping saturated with glue I could also build up a black handle. One advantage compared to epoxy is that the " mess " is easy to clean up and trying this with epoxy means getting glue everywhere ! Washing up PVA from one's hands after using one's fingers to spread the glue is easy with a damp wet wipe. The hide glue would certainly be more historical but not really an issue if one is just making a scabbard for practical reasons. The end results could still look as authentic if covered with thin leather. One last question felix: how is the fit of the blade with that method? I have made a scabbard for my crecy as well, using the chisel approach, and the fit is spot on. Can you reverse the scabbard mouth down with the sword inside without having it sliding down (and fall!). It is more on the tight side and the shape sets a little bit after storing the sword outside the scabbard. This is that my Yeoman and I:33 will stay out about 1cm or will stick in the scabbard for a few hours until it returns to the proper blade shape. This is not an issue with the Crecy scabbard though. I can hold it upside down in all three cases without the sword sliding out. But I think this depends on the correct size of the wooden slats (too wide or too narrow wouldn´t do it good).